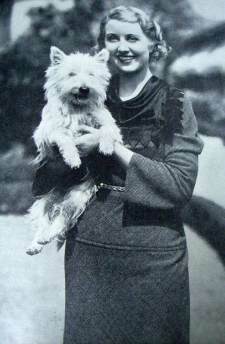 Scottie (or Scotty) dogs were already popular in America before Roosevelt's Fala became the most famous dog in history. Queen Victoria had one, as did Bette Davis, and many other celebrities. Originating in Scotland, the Scottish Terrier has been around since the 15th Century. However, it was in England in 1881 that the first club was founded dedicated to the breed. They were introduced into America in the early 1890s but really only became popular between the first and second World Wars. 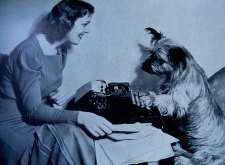 In 1936 the Scottie was the third most popular canine in America. 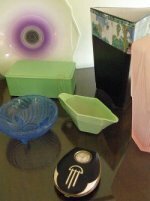 You will find them on everything from the 1920s and 30s, from clothing to ashtrays, from ceramics to ornament, and in all kinds of materials. 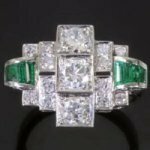 Read more about dogs in the Art Deco era here. But it was in jewellery that this cute doggie was most reproduced. 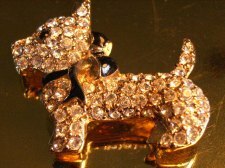 Countless brooches and pins and charms were made in Celluloid and Bakelite , while even sparkly diamante adorned the black or white terrier's form. The most collectable (read expensive) brooches tend to be in coloured Catalin (a form of Bakelite) or those which have nodding heads. 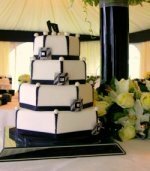 Make sure you have a really good look at the photos and check for condition - no chips or cracks, and paint in good condition if applicable. 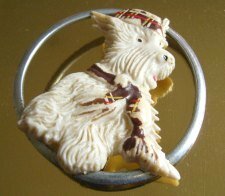 Check out the great vintage Scottish terrier jewelry and collectables on Etsy.